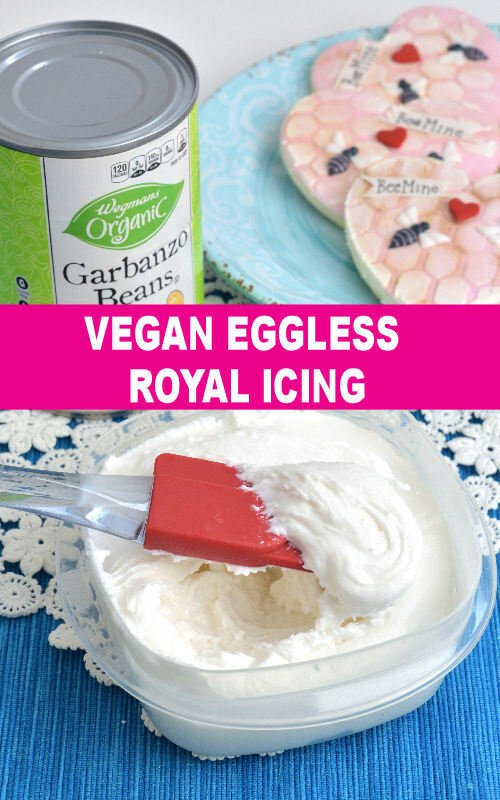 Did you know you can make Vegan Royal Icing from chickpeas? I finally tried it and it works. 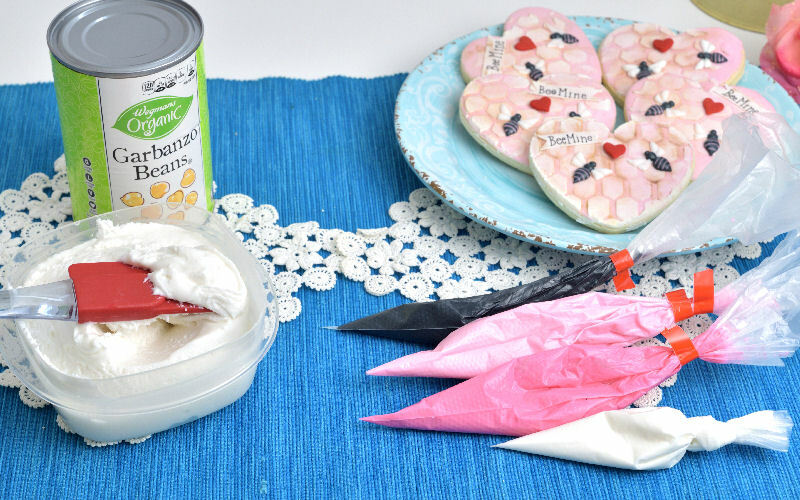 Who would have thought that chickpeas, an annual legume can be used to make something sweet? I like chickpeas, I use them in salads or eat them plain with apples. They are the main ingredient in hummus. Little did I know that brine from chickpeas can be used to make Vegan Royal Icing and Vegan Sugar Cookies. Isn’t that awesome?! So next time you drain chickpeas be sure save the brine. You can also freeze it for later. Make sure to drain the chickpea brine through a fine mesh sieve. 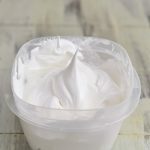 Just in case there are some bits in the aquafaba. You don’t want those in your vegan royal icing. Into the aquafaba add cream of tartar and whip until foamy. Then you can add all of the powdered sugar all at once. Using a wire attachment beat on low speed until thick. I also add little bit of white food coloring while it’s mixing. To flavor my royal icing I like to add with Vanilla, Lemon and Almond extracts. I know it seems like an odd combination of flavors but it really works. Of course, nothing is set in stone and you can experiments with other flavors. However I’d recommend that you stick with Vanilla Extract. You can then add other flavors of your choice. I use gel food coloring to color royal icing. To bag the the icing I mostly use disposable piping bags bags and a tape sealer to seal them. Make sure to get the tape too, as the sealer doesn’t come with it. Royal icing made from canned chickpeas brine. 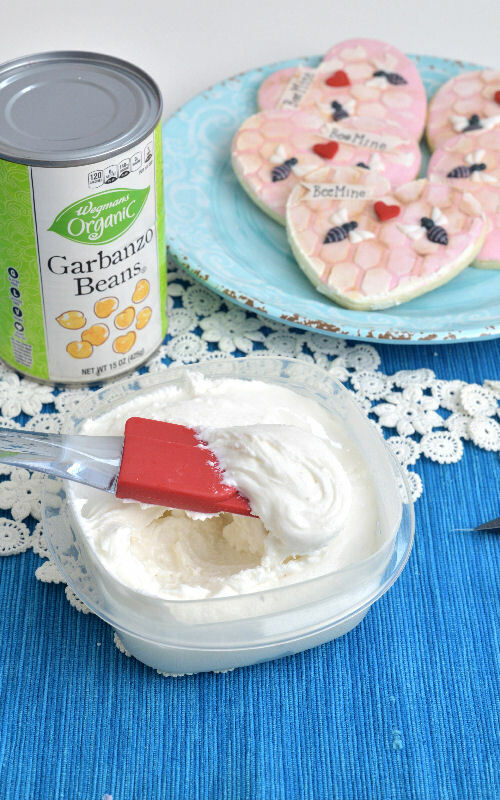 Great for cookie decorating. Store in the fridge, for up to 5 days. Open a can of chickpeas, drain and strain the brine though a fine mesh sieve. Store in an airtight container, covered with plastic wrap and closed with a lid in the fridge for up to 5 days. Let come to room temperature before adding water to thin icing for decorating as desired. 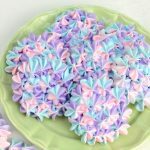 Icing can be colored with gel food colorings. 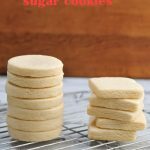 Here is my post about Vegan Sugar Cookies in case you missed it. 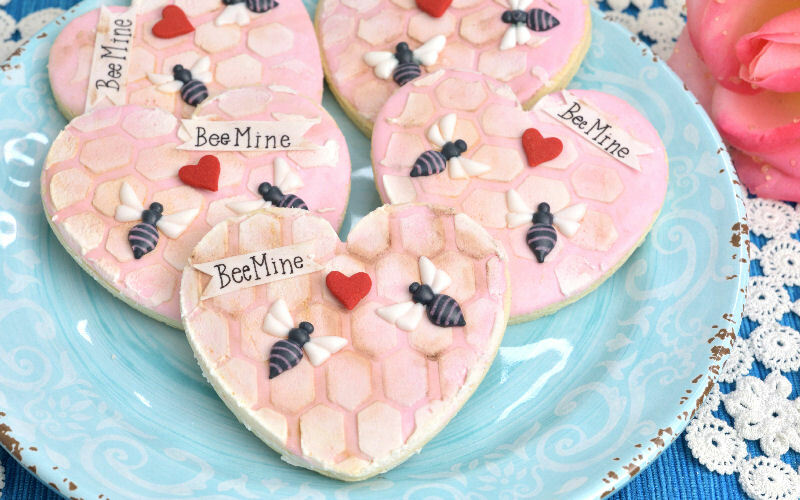 I used Vegan royal icing to make these pretty Bee Mine Valentine’s Day Cookies. 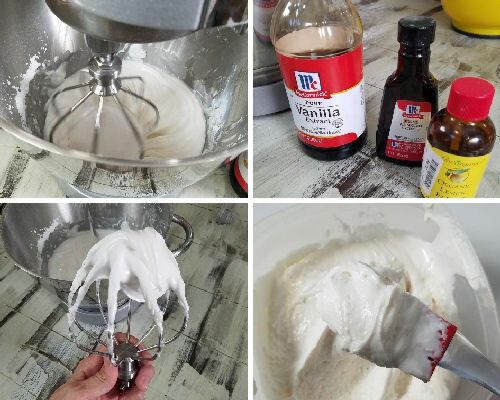 When making regular Royal Icing, how much corn syrup do you add to a recipe? Thank you. HI Margaret, depends on the batch size. 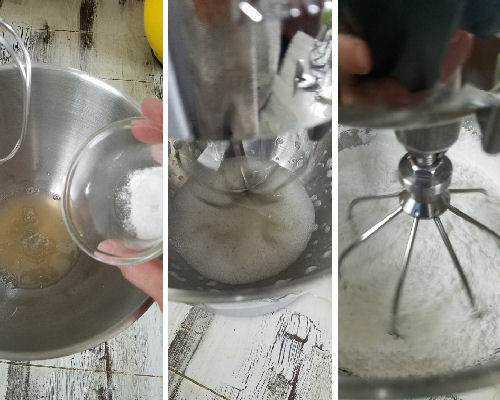 When making a regular batch(using either 2lb powdered sugar, or 1kg powdered sugar – I add 1/4 cup to 1/3 cup corn syrup. Mix it thoroughly and use as usual. Hi Hani, how long this RI stays good once yo had decorated the cookies? Hello Mary, I haven’t kept it longer than 5 days. But my understanding is that you can freeze aquafaba. I also left it at room temperature for 2 days and it was fine, too. Could I use this as a drip on a vegan buttercream cake? Hi Stacey, I haven’t tried it. It dries hard but I think if you add corn syrup to make it a bit softer it could work. But like I said I haven’t tried it my self. Thank you. 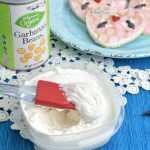 Can vegan icing be left on the counter for several days? Also, can I freeze it? Thank you for your reply. 1-3 days should be fine. After that I noticed it started to separates a little. I haven’t tried freezing it myself but I recall someone telling me you can freeze chickpeas brine so I assume it will be fine to freeze the vegan royal icing. I freeze regular royal icing all the time. Hope it helps. Hi Hani! I was wondering if this vegan RI dries as hard as regular RI? In the comments above you mentioned your transfers dried slower, would you recommend anticipating longer drying time for flooding? Transfers for some reason took a bit longer to dry but overall I think it is very similar to regular royal, I don’t think you’d need extra time for flood to dry. I think perhaps because bees were a bit puffy that is why extra time was needed for them dry completely. I like how shiny the icing was. 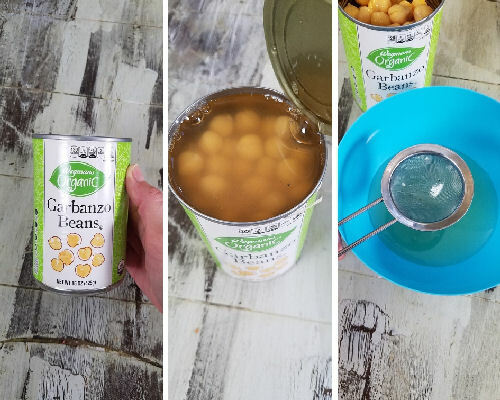 You can also freeze the aquafaba ( bean juice). I freeze it in ice cube trays, 2 Tbls per cube. That’s awesome to know. Thank you for sharing. Is it necessary to keep this vegan RI 5 days on the fridge before using it? My own recipe I use it directly. 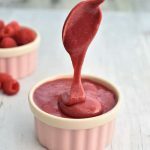 I have a bleeding prob with my colored RI, is this recipe avoid this prob? You can use it right away. I meant to store it. Bleeding can occur for number of reasons. Food coloring, higher humidity. Try using a fan when drying the cookies. So these are regular, salted chickpeas? I just looked at the can of the chickpeas I use and there is sea salt, sodium 140mg. I’m not sure if it differs from brand to brand. I think it dries very nicely with a nice shine. It was setting up pretty fast actually but it could have been ambient temperature, I worked by the wood stove. 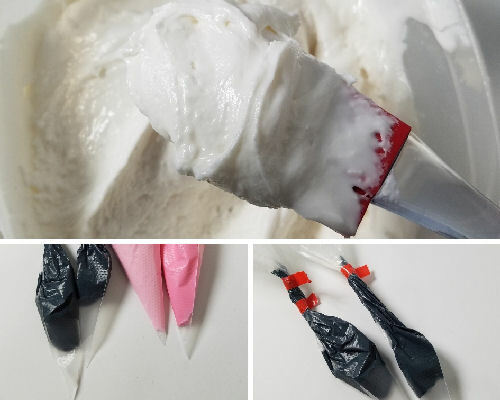 I was able to make different consistencies and I should have a tutorial out soon where I used it make royal icing transfers, they took a bit longer to dry than with traditional royal icing but at the end it worked. 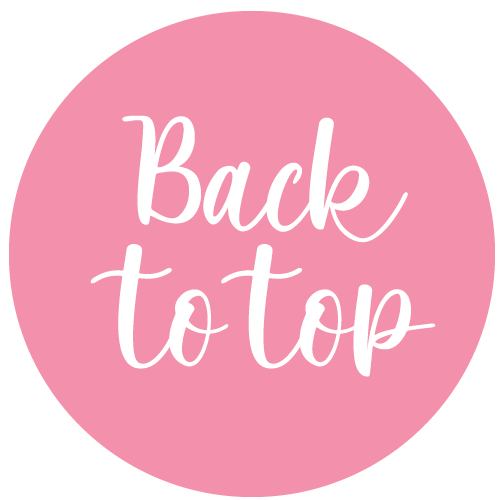 Great alternative for folks with egg allergies! I’ve heard so many positive things about using the beams. Will give it a try! I totally agree, my neighbor has an egg white allergy also. I’ll be using it to make her some cookies. Thank you. Hi Hani, you mix all 3 flavors (vanilla, almond, and lemon) together in one batch? Thanks. Yes, indeed.Vanilla is the main flavor and then I add little a little bit of almond and lemon. 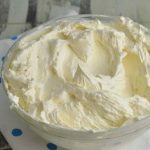 You can also use just vanilla, or add only extra almond. Make it your own.Thank you. Keep me posted how it goes.